Global Warming. The birds are happy that humans will be extinct. "But doctor, I see the Happy Face everywhere!" Smile to the camera guys! Happy now, miserable in a second. God is laughing at your fail. I'm so high,I feel like I'm flying! The face is SOOOOO stoned! Is it just me? 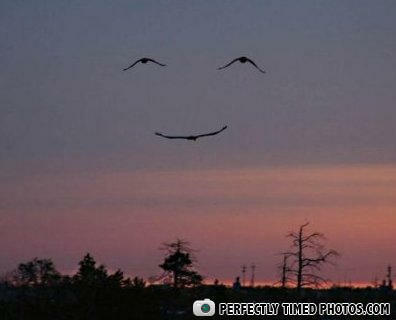 Or are the birds making an epicface at us? A dead baby dressed as a clown.